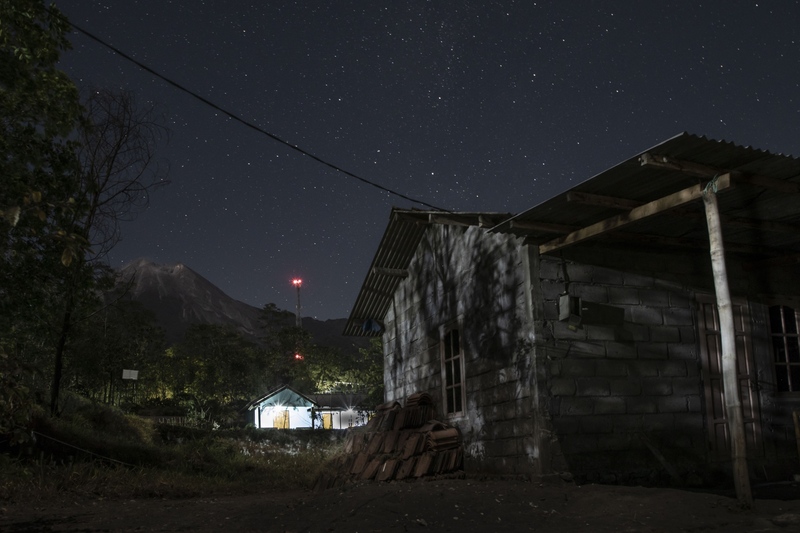 A view of Mount Merapi at night. Rarely can one see the volcano crater and the stars in the sky. Most of the time, Merapi is covered by clouds due to its high elevationof about 9,600 ft. When one can see it like this it seems as if the most active volcano of Indonesia is slowly breathing. Locals therefore think of it as a living creature, one that needs to be respected. To keep the volatile natural phenomena in balance, prayer and spiritualism are key to people living by the mountain. 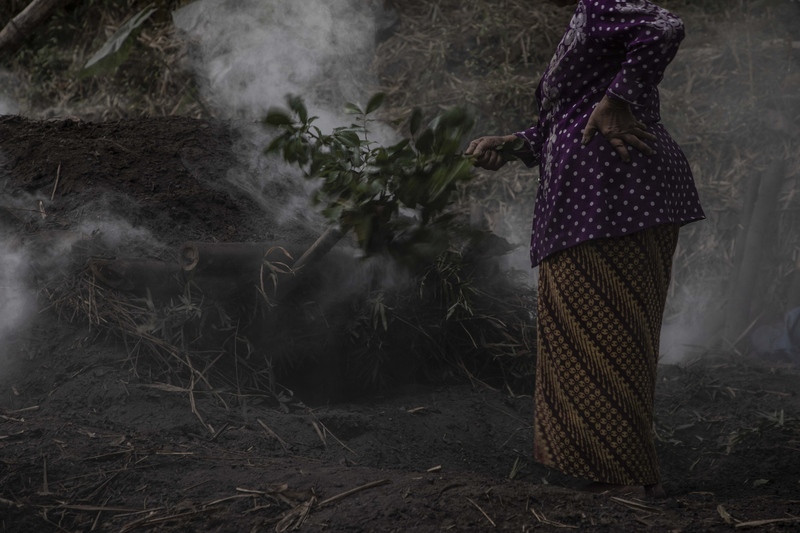 Early in the morning, Mbah (grandmother) Sudiwiyono, 77, patiently observes the slowly burning fire she regularly lights to make charcoal. She is the only inhabitant of Palemsari, one of the highest villages on Mount Merapi. 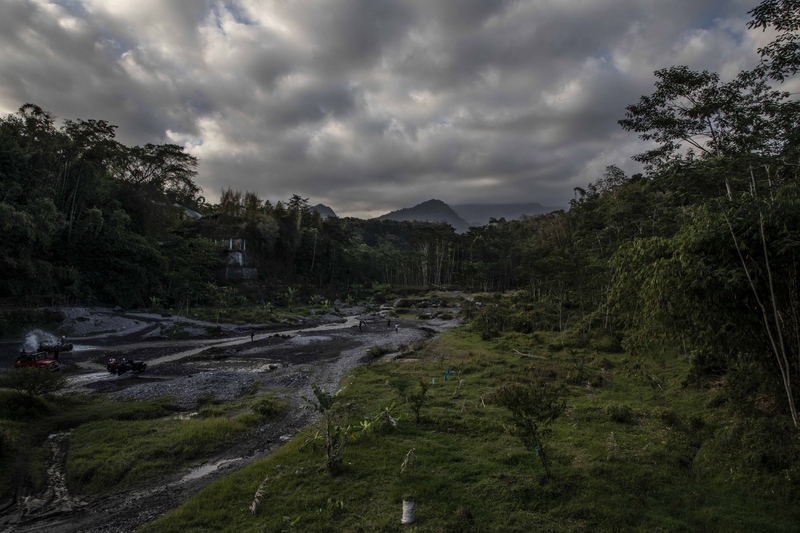 While all members of her community either died in the last devastating volcanic eruption (in 2010) or moved to a relocation village, she decided to stay in the dense forest as it allows her to be close to nature and on the land that belongs to her. 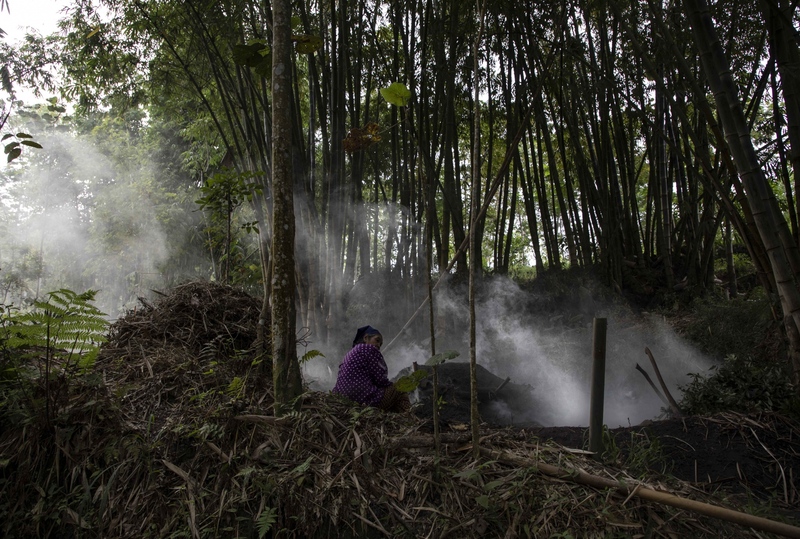 It takes Mbah Sudiwiyono 3 days to produce charcoal. She then sells it to local villagers. She is the only woman doing so and has learned this careful procedure 62 years ago on the same land she still calls home despite all hardship and risk it represents, and all loss that it witnessed. Mbah Ibu Ponirah Maridjan, 86, praying at her house in the village of Karang Kendal, about 3 miles away from Palemsari. The Javanese believe that the Earth is not only populated by human beings, but also by spirits (makhluk halus). 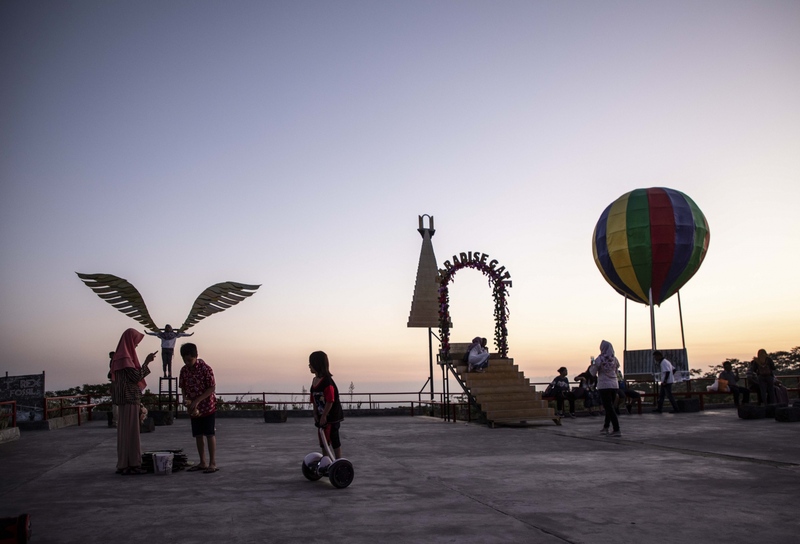 These beliefs are mixed with Islam, Indonesia's most predominant religion, and those dating from the island's Hindu-Buddhist period. For Mbah Ibu Ponirah Maridjan the dedication to prayer has an even more special meaning - her husband was and son now is the spirit keeper of the volcano. The volcano on a regular day in the dry season in mid-August. Being covered by clouds most of the time, it provides very fertile soil and a good livelihood for locals. Dedication to and protection of nature are therefore key to locals who believe gods inhabit the mountain that keep it calm if humans treat the environment well. 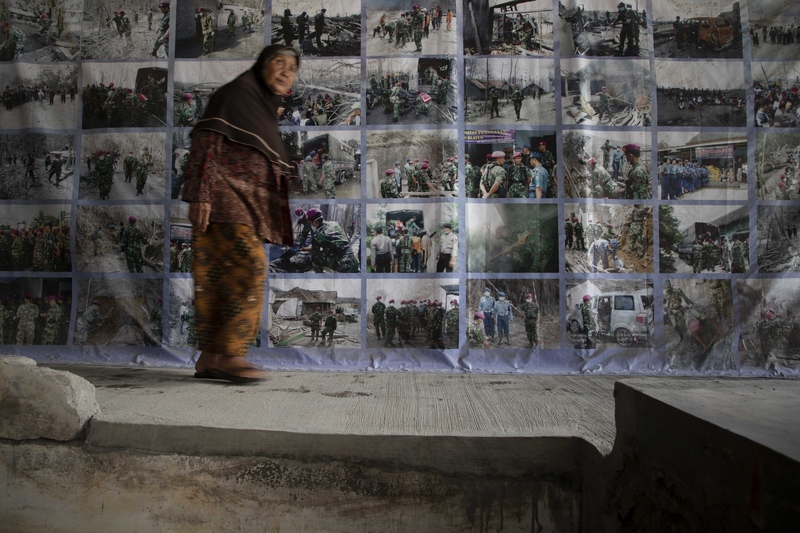 Mbah Srirahayu, 41, portrayed in her new home in the village of Karang Kendal. She lost her brother, sister, and niece in the devastating volcanic eruption in 2010 (that killed 353 people). Survivors like her - in total about 80 families - that previously lived in Palemsari were relocated here in past years. She greatly respects the mountain and like believes that respecting the spirits, taking care of the environment, and of people are the only way to be free from fear of living close to it. 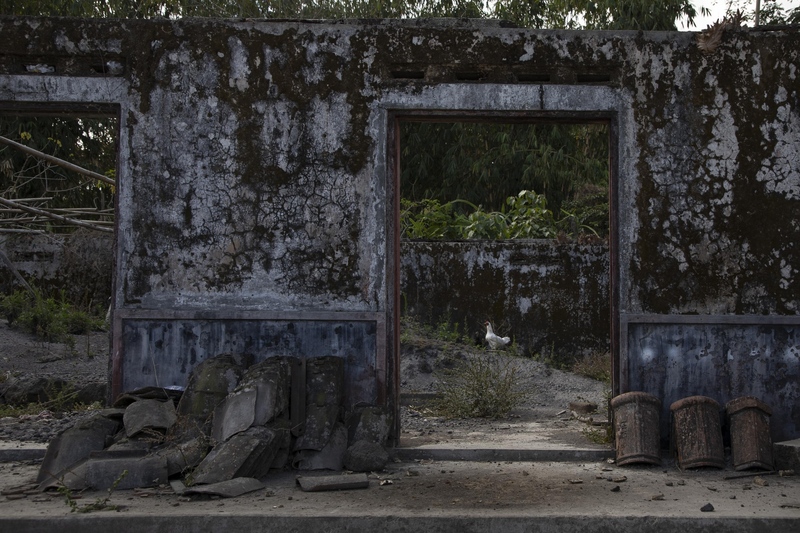 An abandoned home in the high risk zone of the volcano. 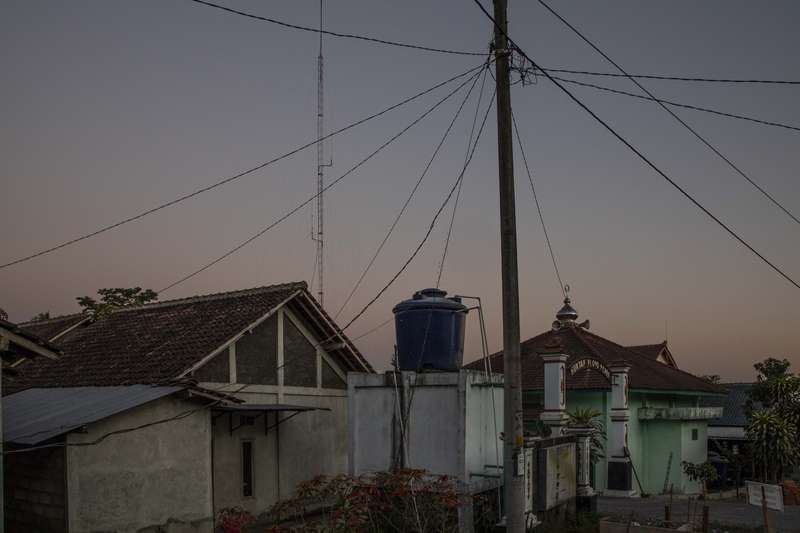 Most of its former inhabitants now live in relocation villages like Karang Kendal. As refugees that have been forced to leave their homes, women return on a daily basis to the land that still belongs to them to undertake activities - like collecting wood and cress - due to their need to maintain a livelihood for their families. 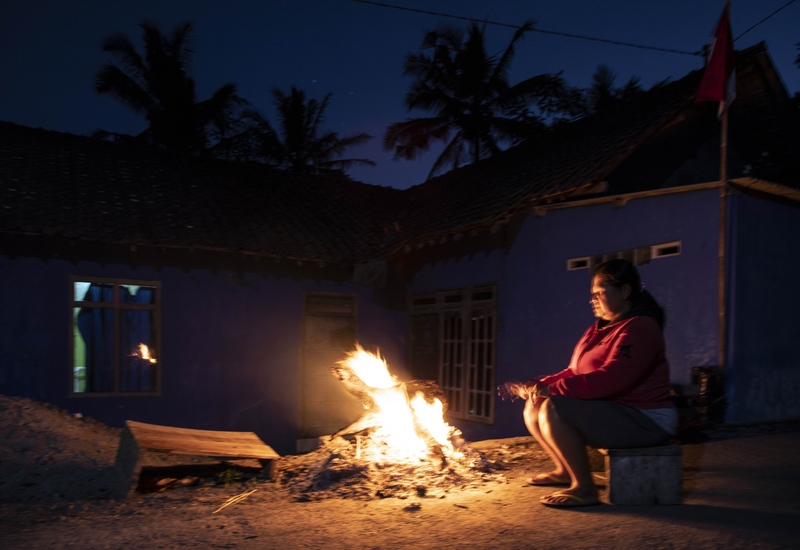 Rusmiyati, 45, sits by a fire in the evening, near the ruins shown in the previous picture. She refuses to move to a relocation village as she feels that the high risk zone continues to be her home. 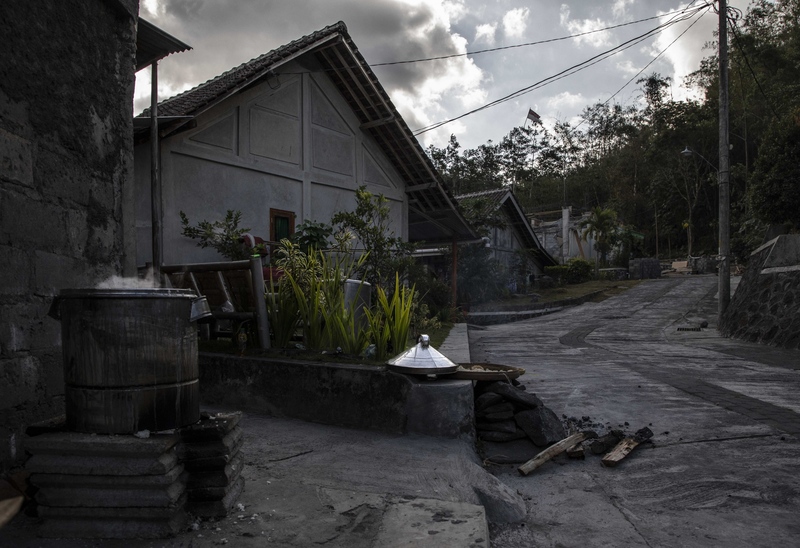 Traditionally the ‘home’ of the women living on Merapi was the place where they would live and work. 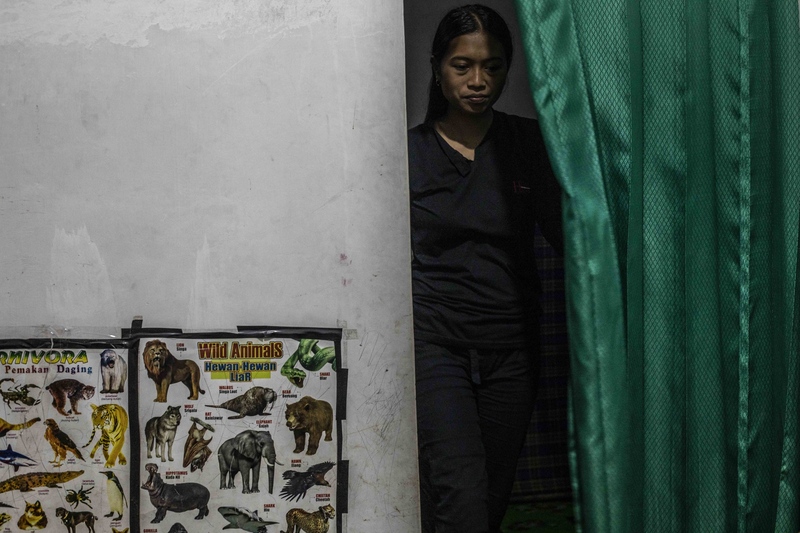 For the relocated, the relocation village has become their home, however, with no land that belongs to them, their former land has become a place of work. 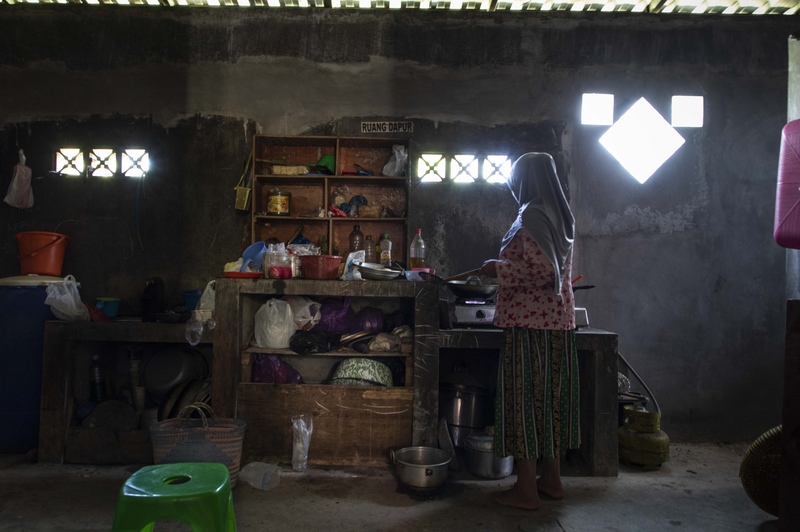 A view into the kitchen of Mbah Parish, 67. Mbah Parish walks up the stairs in her house. It is simple but new like all in the relocation village of Karang Kendal. 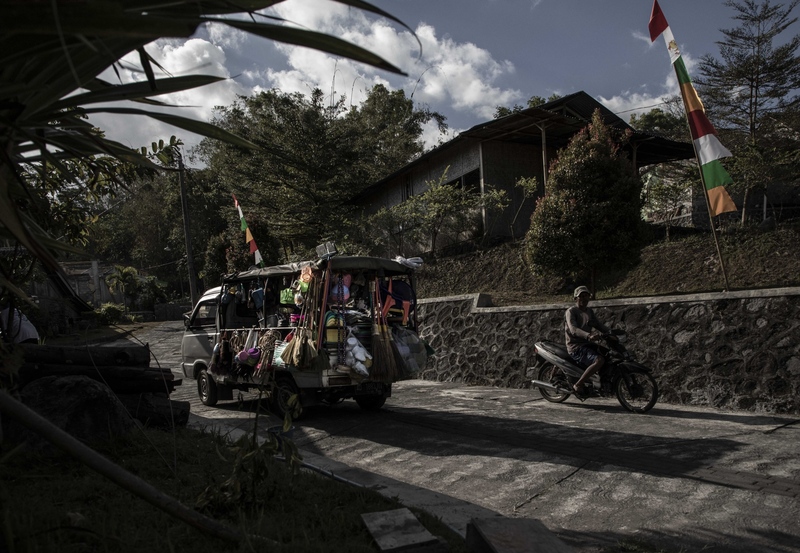 The relocation of village of Karang Kendal is located several kilometres further down the mountain from the previous village of the survivors of the 2010 volcanic eruption. The government constructed this new community building homes and paving roads. However, The transition to the site has not been seamless: there is a prevailing sense of aimlessness among older residents who are not accustomed to the confines of the new community, which has no fields or even private yards. Mbah Ibu Ponirah Maridjan shortly after finishing her prayers. She is the wife of Mbah (grandfather) Maridjan, the former spirit keeper of Mount Merapi, who died in 2010. His remains were found covered in ash in a praying position. After his death, her son Asih Lurah Surakso Sihono was assigned this prestigious position by the Sultanate of Yogyakarta, a city of half a million about 20 miles south of Merapi. Traditionally, men are being appointed spirit keepers. 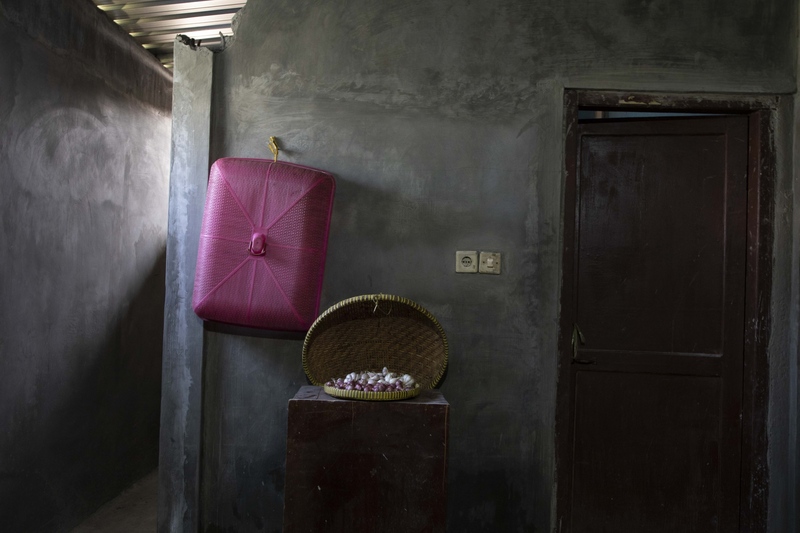 Mbak ('sister'/young woman) Barni, 24 years, showering her daughter in their house in th viillage of xy. 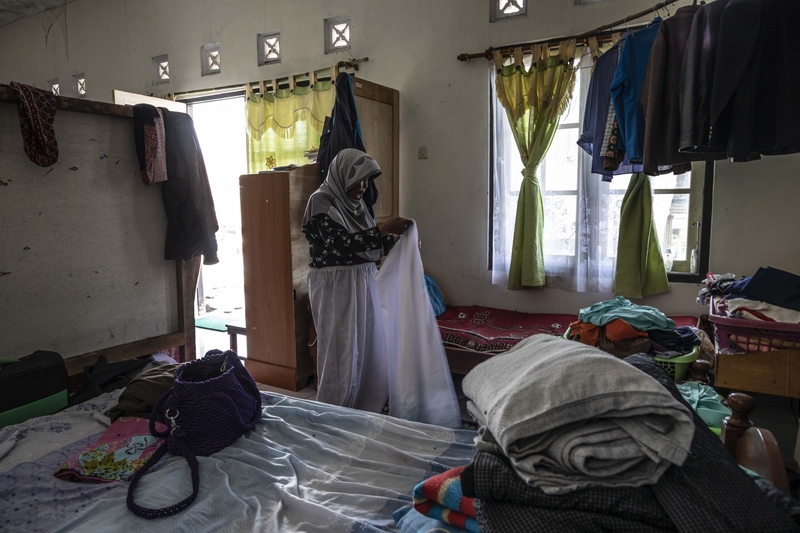 She lives here with her husband but frequently visits her mother who now lives in Karang Kendal. Barni grew up in Palemsari but went to school in a city far away from the mountain for 6 years. Yet, she decided to return to the mountain after high school because of the dedication of people to nature here, their respectful caring of others, and their unique and deep cultural roots. 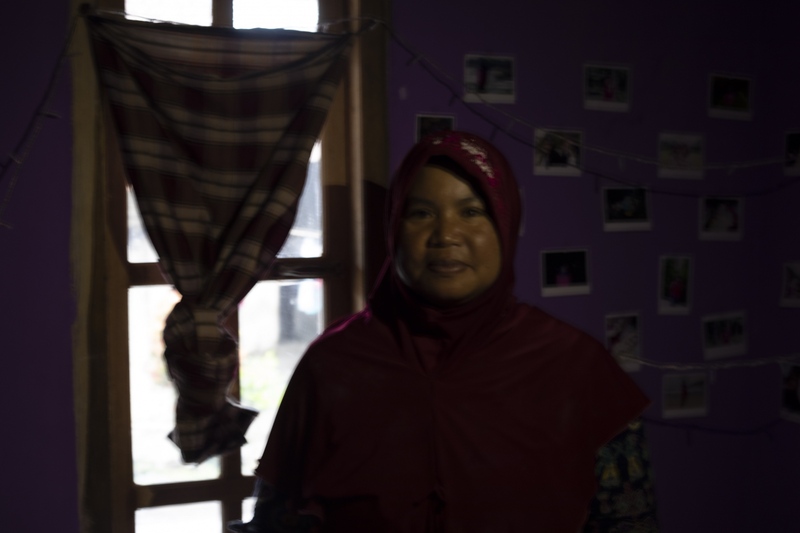 Although she will also ensure her daughter receives a very good education, she hopes that she will live close to the mountain later in her life. 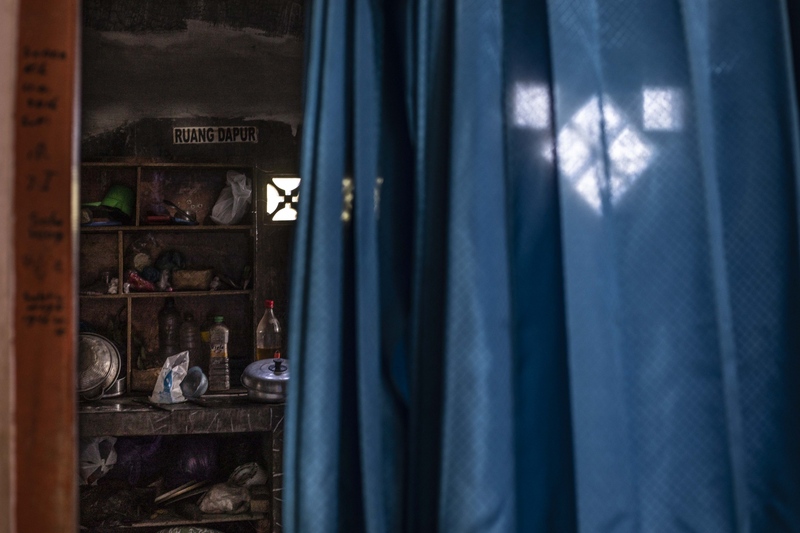 Another view into the kitchen of Mbah Parish in Karang Kendal. A woman cleaning cows in Karang Kendal. Today, it is the women who take care of the agriculture production in the mountain while men work in the nearby cities. The daily live of women is therefore strictly structures around the times when the cows need to be milked, fed, and washed. Agricultural productivity is a direct result of Merapi. The short-term destruction of its eruptions is 'outweighed' by the long-term benefits of the nutrients that ash falls bring to soils, especially as coupled with abundant rainfall. Cows also represent the savings of families. In hard ties, they sell them to make a living when no other forms of income are available. Mbah Sudiwiyono collecting fresh cress to prepare the wood coal fire early in the morning. She does so barefoot to be even closer to nature. The forest of the mountain is her home. 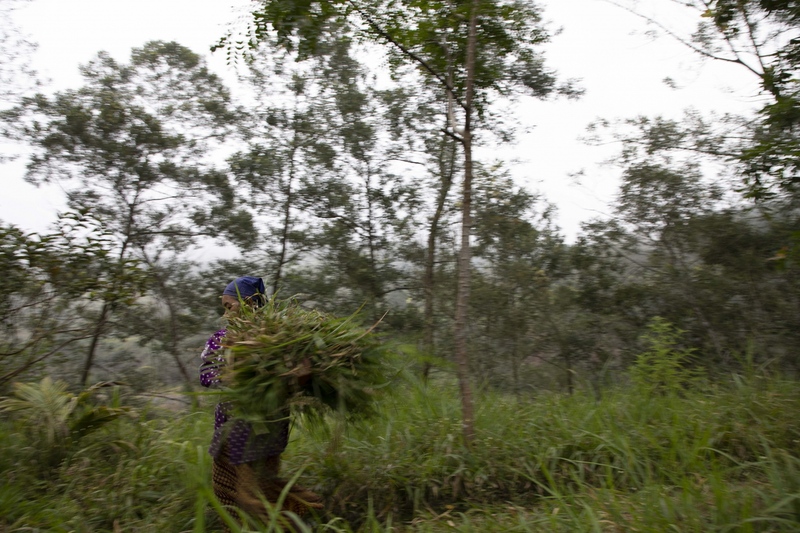 Most women use the forests around their villages to make a living by collecting wood, or grass, mostly for livestock. Mbah Parish preparing lunch in her kitchen. The village of Barni and her family. 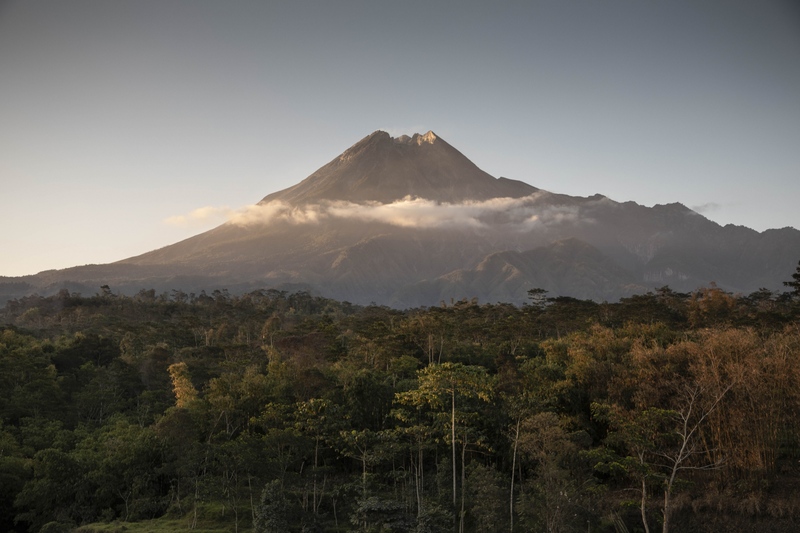 About 70,000 people live in the immediate vicinity of the volcano. Due to the density of the population living around its slopes, past eruptions caused high numbers of victims. In recent years, the area of high risk zones has therefore been increased. 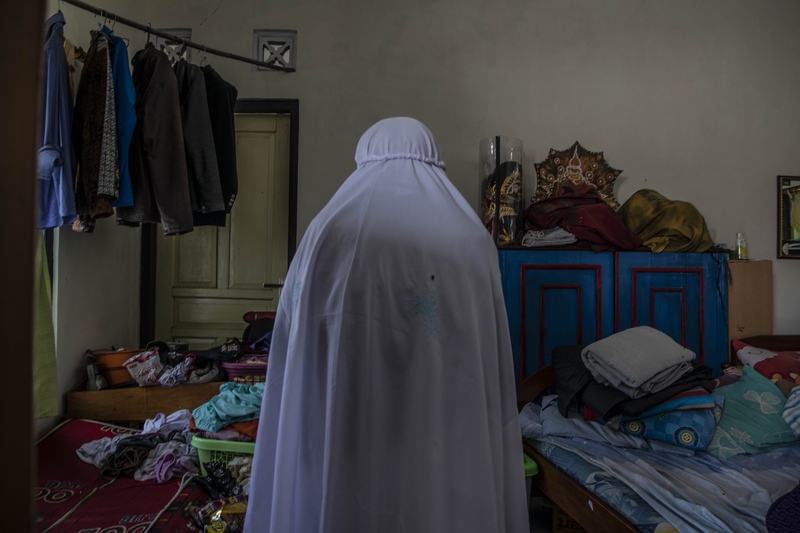 Mbak Barni (without the Hijab she usually wears) in her house in a moment of silence after showering her daughter and finishing all family -, community-, and agricultural duties of the day. 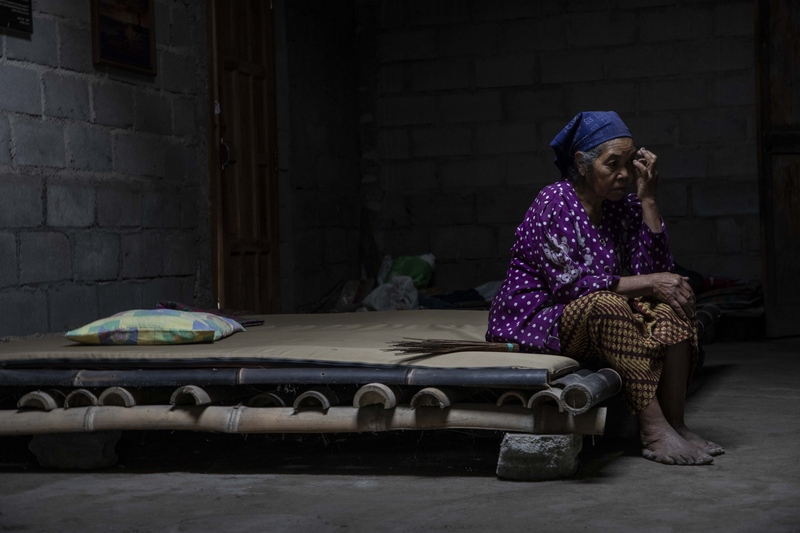 Mbah Sudiwiyono taking a break on the bed in her one-room house in the forest near the volcano crater. The walls and roof were rebuilt after the 2010 eruption. As the only remaining inhabitant of her village, she sometimes misses her family and neighbours at these quite hours after finishing all work. Yet, she feels more comfortable living here in the place where she was born and lived in for almost all her live. 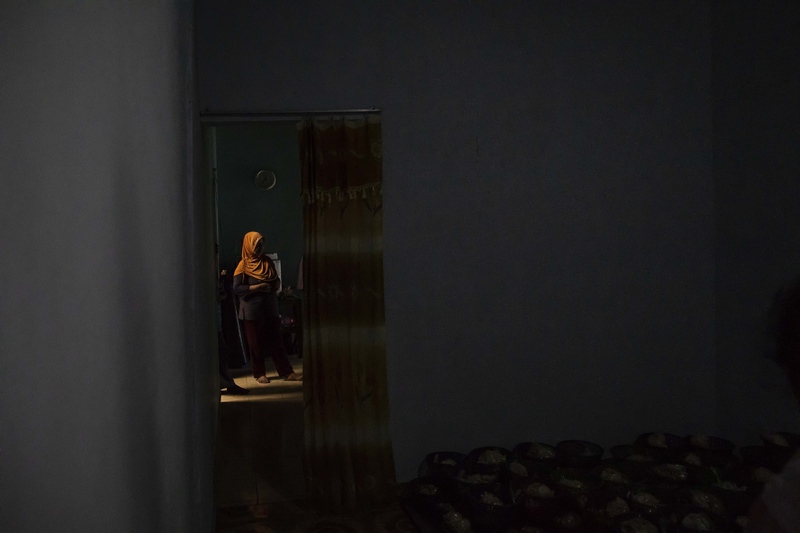 A woman in Karang Kendal speaking to other women in the evening after spending hours of cooking together to prepare food for the festivities of the Indonesian Independence Day that is being celebrated on August 17th. 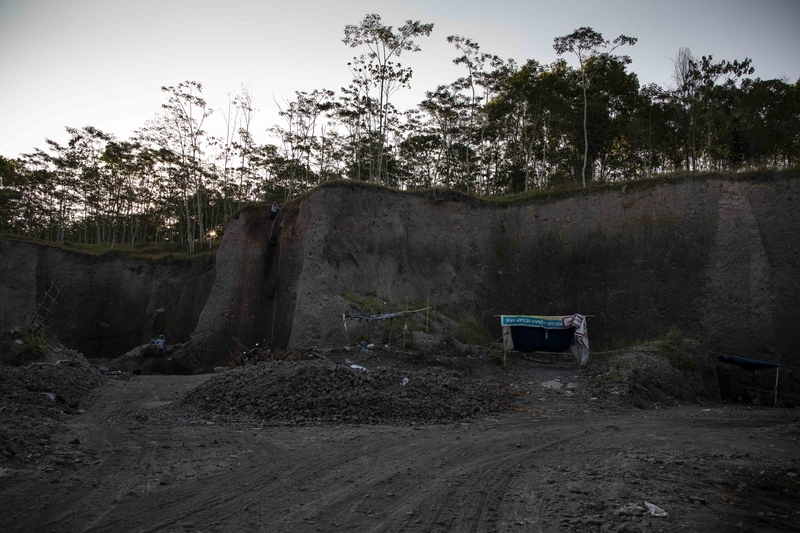 A sand-mining ground on Mount Merapi. In recent years, illegal sand mining has become a controversial reality of mountain life. In the past, locals would often manually - and legally - mine the location which naturally limits the amount of sand they are able to obtain. This is even necessary due to the amount of sand the volcano produces when erupting. 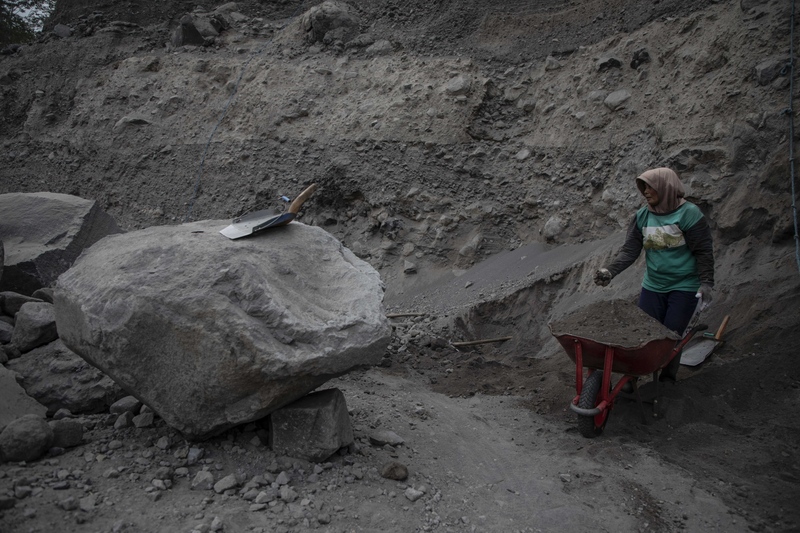 However, large-large-scale mining activities by non-locals have developed after 2010 and continue to take place despite lack of authorization by the government. Scientists are certain that this severely threatens Merapi`s lava embankments. Locals for whom the mountain is sacred, believe it will anger the ancient Javanese spirits inhabiting it and cause further eruptions. An afternoon street scene Karang Kendal - the few cars that visit the village are usually local sellers of household goods. 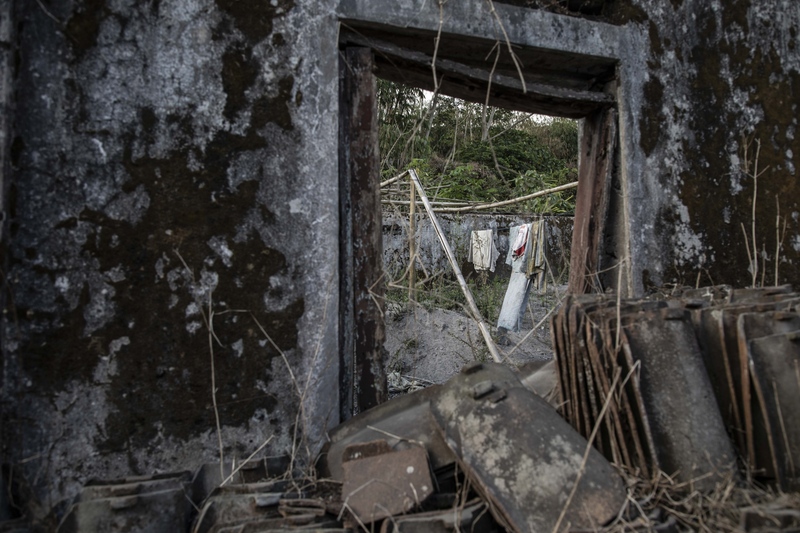 Remains of the former village of Mbah Ibu Ponirah Maridjan. 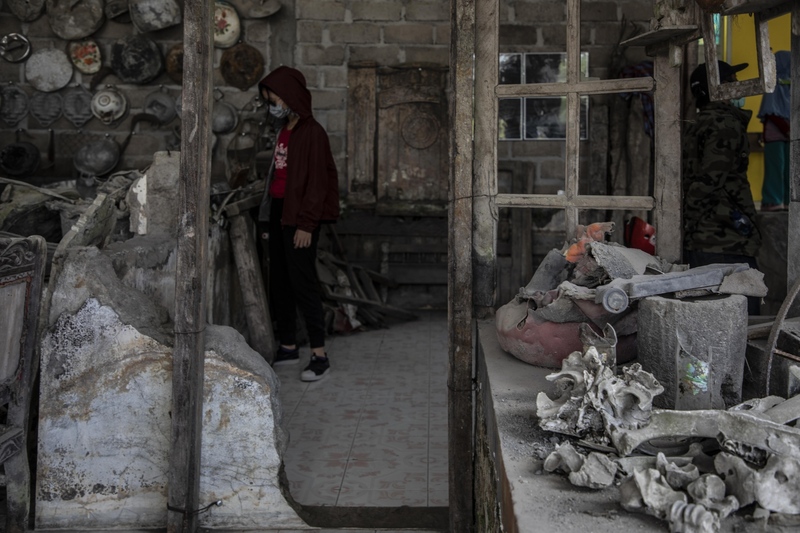 When Merapi erupted in 2010, a month-long rash of volcanic activity killed about 350 people and saw hundreds of thousands displaced in Indonesia. At that time, this place was ground zero. Today it is a place of remembrance for lives lost, especially Mbah Maridjan, the former spirit keeper and husband of Mbah Ibu Ponirah Maridjan. Every Saturday Mbah Ibu Ponirah Maridjan returns to her former village mourning her husband and meeting local visitors that ask her about the 2010 eruption. Around her are images of the relief and relocation efforts following the eruption. Traces of former community life in an abandoned home tin he high risk zone of the mountain. 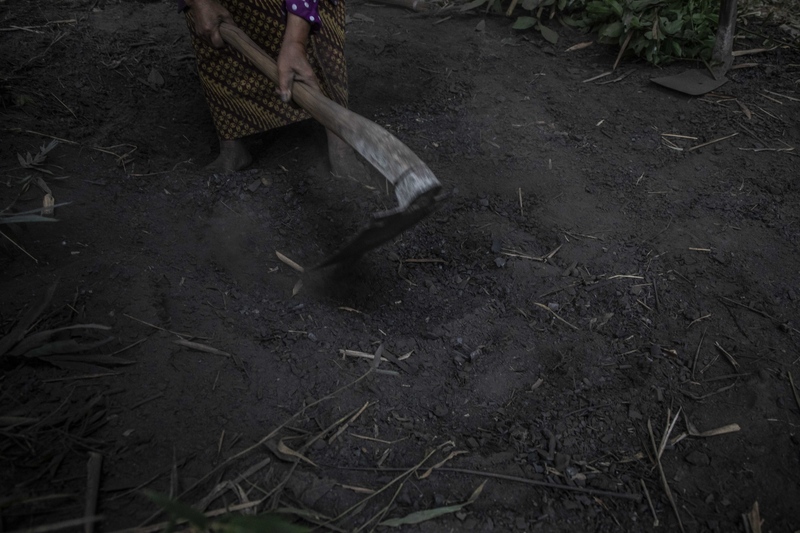 Mbah Sudiwiyono digging a whole into the ground to prepare the the fire to make charcoal. Despite her persistent and hard work she remains very poor receiving about 15000 to 20000 Indonesian rupiah (1 to 1.30 US Dollar) for one kilo of wood coal and sells in big packs of about 30 kilograms at irregular times. She can only produce charcoal in the dry season from May to September. 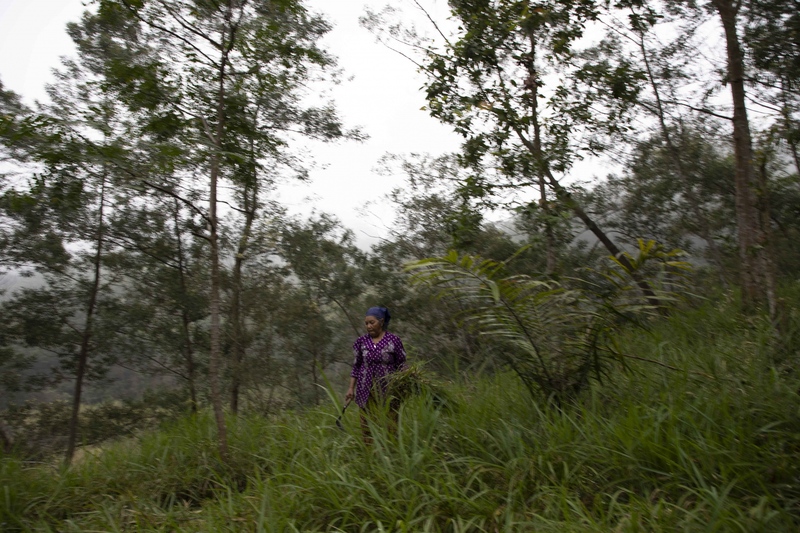 Mbah Sudiwiyono walking through the deep forest that surrounds her house. Each morning she collects cress for her two goat and the fire she lights to make charcoal. The name 'Merapi' could be loosely translated as the Mountain of Fire. Part of the volcano is located in the Southeastern part of the Pacific Ring of Fire–a section of fault lines stretching from the Western Hemisphere through Japan and South East Asia. Mount Merapi, located in Central Java, produces more 'glowing clouds' (nuee ardentes) than any other volcano on earth. It has a violent past, erupts regularly, and yet, generations of people continue to live by it. Especially those close to the crater believe in the extraordinary importance of Merapi for Javanese society. This story takes a deeper look into the lives of women. 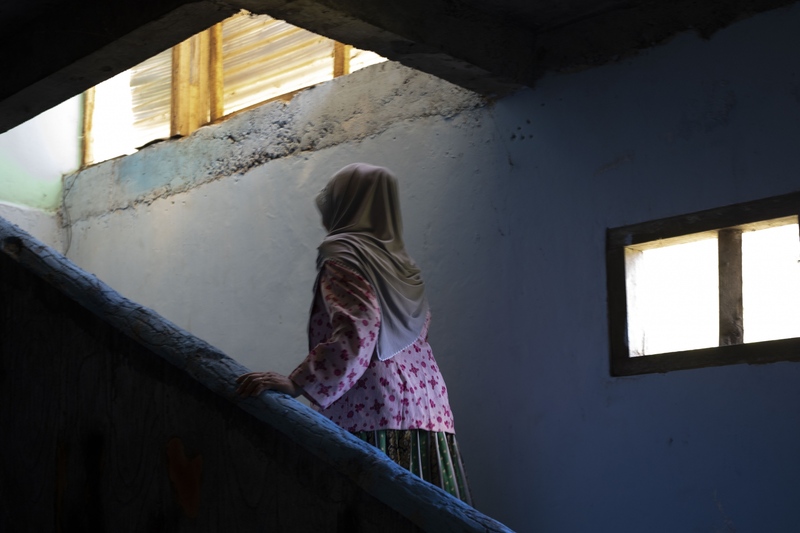 It highlights their resilient ways of facing live as refugees, loss, and resettlement. It gives insights into their Muslim faith, spiritualism, and dedication to the fragile mountain ecosystem that is currently under serious threat by illegal sand mining. This story would not have been possible without the guidance, friendship, and assistance of Aries Danu Jundan Susilo.